Students in my Intro to IR class have turned in papers dealing with ethics in international relations. One of the papers has an interesting quote by a Lieutenant General John L. DeWitt (who [my student claims] ultimately ordered the internment). 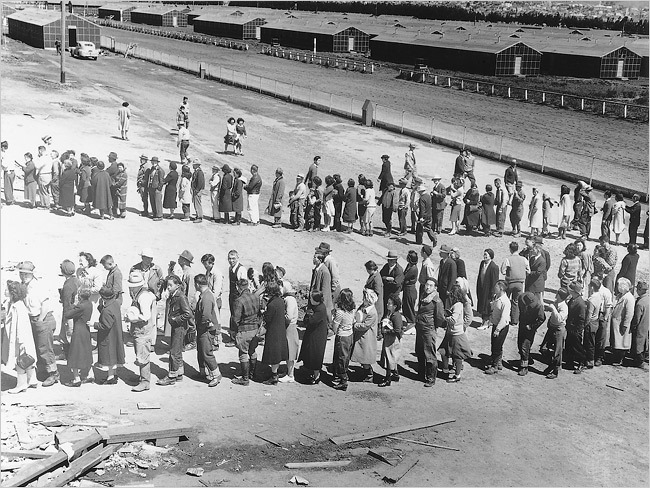 “I don’t want any of them [persons of Japanese ancestry] here. They are a dangerous element. There is no way to determine their loyalty… It makes no difference whether he is an American citizen, he is still Japanese. American citizenship does not necessarily determine loyalty… But we must worry about the Japanese all the time until he is wiped off the map” (Mullen)*. *Here is the source: Fred Mullen, “DeWitt Attitude on Japs Upsets Plans,” Watsonville Register- Pajaronian, April 16, 1943. Reproduced by Santa Cruz Public Library, accessed April 6, 2008. I guess that’s because the American media knows what the real issues are–Barack Obama refusing coffee for orange juice at a diner in Pennsylvania, Hillary Clinton doing shots in a Pennsylvania bar (were they body shots? ), and lapel flag pins. In his speech McCain proposed that the United States expel Russia from the G8, the group of advanced industrial countries. Moscow was included in this body in the 1990s to recognize and reward it for peacefully ending the cold war on Western terms, dismantling the Soviet empire and withdrawing from large chunks of the old Russian Empire as well. McCain also proposed that the United States should expand the G8 by taking in India and Brazil—but pointedly excluded China from the councils of power. We have spent months debating Barack Obama’s suggestion that he might, under some circumstances, meet with Iranians and Venezuelans. It is a sign of what is wrong with the foreign-policy debate that this idea is treated as a revolution in U.S. policy while McCain’s proposal has barely registered. What McCain has announced is momentous—that the United States should adopt a policy of active exclusion and hostility toward two major global powers. It would reverse a decades-old bipartisan American policy of integrating these two countries into the global order, a policy that began under Richard Nixon (with Beijing) and continued under Ronald Reagan (with Moscow). It is a policy that would alienate many countries in Europe and Asia who would see it as an attempt by Washington to begin a new cold war. Kosovo’s independence declaration on 17 February 2008 sent shock waves through Serbia’s politics and society, polarising the former in a manner not seen since the Milosevic era. Rioting led to attacks on nine Western embassies, destruction of foreign property and massive looting. The government fell on 10 March, split over whether to pursue a nationalist or pro-Western path. 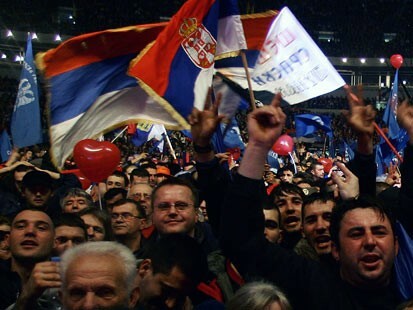 Belgrade’s efforts to create a de facto partitioning of the north of Kosovo threaten the new state’s territorial integrity and challenge deployment of European Union (EU) missions there, and Serbian parliamentary and local elections on 11 May are unlikely to change the basic policy towards the new state, even in the unlikely event a pro-Western government comes to power. They may, however, well give Serbia’s nationalist parties new leverage. The election campaign is heated. Verbal attacks have increased against opposition parties, independent media and non-governmental organisations (NGOs) that disagree with the hardline nationalist policy on Kosovo. After the polls, one of two main scenarios is likely, since no party will win enough votes to form a government alone. Nationalists from the Serb Radical Party (SRS) could form a coalition with the “People’s Bloc” led by Premier Vojislav Kostunica’s Democratic Party of Serbia (DSS) and the late dictator Slobodan Milosevic’s old Socialist Party of Serbia (SPS). If nationalist forces win, Euro-Atlantic integration will come to a halt, and Serbia will enhance its ties with Russia. They will support a more belligerent response in Kosovo, and Kosovo Serbs’ use of low-level violence. They may encourage Republika Srpska to leave Bosnia-Herzegovina and meddle in Macedonian internal affairs. A backlash against pro-Western parties and their supporters and an increased climate of media repression can be expected. Uncertainty will lead to a fall in foreign direct investment and economic growth. Alternatively, pro-Western forces might form a weak government, but only with the support of nationalists, such as the DSS or SPS. Serbia could then anticipate the same kind of domestic instability it experienced under the outgoing government. If the more pro-Western Democratic Party (DS) tried to chart an openly pro-EU course, it would face the type of obstruction and opposition that led to Premier Zoran Djindjic’s assassination in 2003. At best, the EU and U.S. will have limited influence for many months, until a new government is formed, which may not be until September or later. Meanwhile, the public anger over Western support for Kosovo’s independence is such that any attempt to pressure or even induce Belgrade into more cooperation risks strengthening the nationalist vote. Brussels and Washington would be well served to lower levels of rhetorical support for the more pro-Western Democratic Party (DS) of President Boris Tadic, G17+ and the Liberal Democratic Party (LDP) and end interference in the campaign via promises of a Stabilisation and Association Agreement (SAA). offer increased support to civil society. 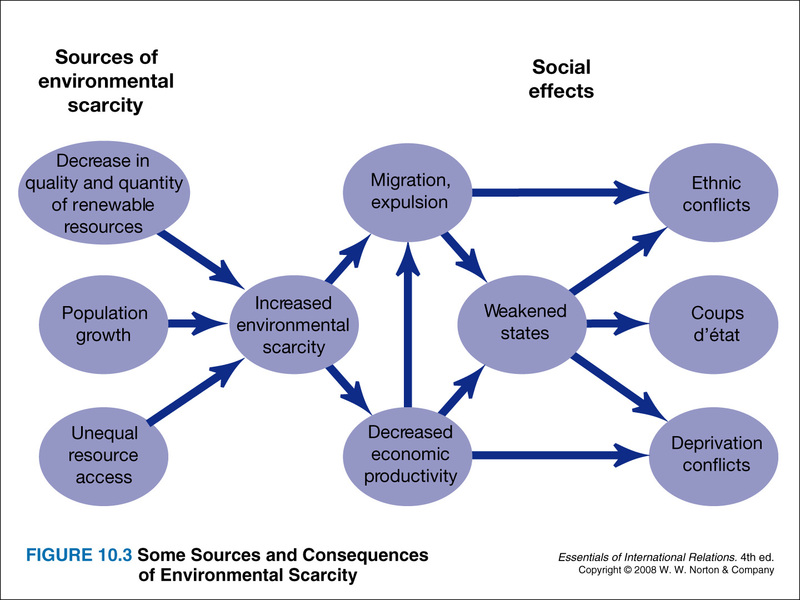 In intro to IR on Wednesday we addressed global environmental issues and we went over this chart outlining Thomas Homer-Dixon’s overview regarding the link between environmental scarcity and security. According to Homer-Dixon, environmental degradation is not only an important economic, social, and health issue, it is crucially an issue of importance for global security. We see the important link between increased environmental scarcity and social effects (like ethnic conflicts, deprivation conflicts and coups d’etat), facilitated indirectly at times by the conditions of weakened states. Homer-Dixon argues that these environmentally-driven conflicts will increase the more the environment degrades. Moreover, it is just those places in the world that have the least capacity to deal with the potentially negative effects of environmental degradation whose environments will be most likely to suffer. JERUSALEM — Peace overtures between Israel and Syria moved up a gear on Wednesday when a Syrian cabinet minister said that Prime Minister Ehud Olmert of Israel had sent a message to President Bashar al-Assad to the effect that Israel would be willing to withdraw from all the Golan Heights in return for peace with Syria. The Syrian expatriate affairs minister, Buthaina Shaaban, told Al Jazeera television, “Olmert is ready for peace with Syria on the grounds of international conditions; on the grounds of the return of the Golan Heights in full to Syria.” She said that Turkey had conveyed the message. 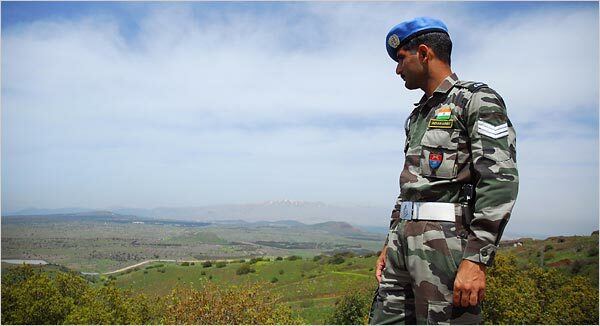 “…Withdrawal from the Golan Heights is a contentious issue in Israel. The territory is a strategic plateau that overlooks a large swath of northern Israel. Israel has objected to past Syrian demands for access to the shore of the Sea of Galilee, a main water source for Israel. plateau that overlooks a swath of northern Israel. 1. Leave your car at home for a day (or a week or a month) and try walking or biking. If work is too far away to walk, take public transit or carpool. One city bus eliminates the emissions of 40 cars. 2. Turn off the lights, the computer and the television when they are not in use. Using only highly efficient and money-saving appliances can reduce the electricity consumption of an average household to one-10th of the national average. 3. Try eating meat-free at least one day a week. A meat-based diet requires seven times more land than a plant-based diet. Livestock production is responsible for more climate change gasses than all the motor vehicles in the world. 4. Choose foods produced organically, locally and in season. Support your regional farmers and farming industry: buying locally and in season is better for the environment than buying foods that have been shipped hundreds of kilometres to your local market. 5. Put a composter in your backyard or use your green bin to reduce household waste. Composting organics has two key benefits: it reduces the amount of waste going to landfills and when added to your garden, helps nourish soil and plants. 6. Turn off your car’s engine if stopped for more than 10 seconds. If every driver of a light-duty vehicle avoided idling by five minutes a day, collectively, we would save 1.8 million litres of fuel per day, almost 4500 tonnes of GHG emissions. 7. Set your thermostat above room temperature in the summer and below room temperature in the winter. For each degree you adjust, you can save 5% on your utility bill and 1% on your energy use. 8. Replace incandescent light bulbs with compact fluorescent bulbs (CFLs). A CFL uses only 25% as much energy as an incandescent bulb and lasts 10 times longer. 9. The simple act of recycling has more impact on the environment than the average Canadian thinks. The amount of wood and paper North Americans throw away each year is enough to heat five million homes for 200 years. 10. This is a great opportunity to brag. Tell someone what you’re doing to make the world a better place. Support the cause. Encourage them to get involved too. The issue of rising food prices globally has come under increasing scrutiny lately and has political leaders concerned. The annual meetings of the World Bank and IMF gave prominence to the problem and newspapers and magazines are weighing in with their opinion on the potential short- and long-term implications of the dramatic spike in world food prices. Will this last? Are we finally facing a neo-Malthusian future or will we be able to find a feasible and politically palatable solution to this crisis? Today’s pictures are different. “This is a silent tsunami,” says Josette Sheeran of the World Food Programme, a United Nations agency. A wave of food-price inflation is moving through the world, leaving riots and shaken governments in its wake. For the first time in 30 years, food protests are erupting in many places at once. Bangladesh is in turmoil (see article); even China is worried (see article). Elsewhere, the food crisis of 2008 will test the assertion of Amartya Sen, an Indian economist, that famines do not happen in democracies. 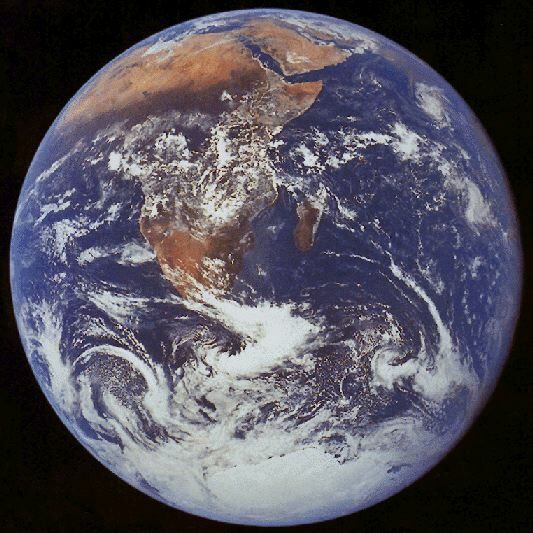 Roughly a billion people live on $1 a day. If, on a conservative estimate, the cost of their food rises 20% (and in some places, it has risen a lot more), 100m people could be forced back to this level, the common measure of absolute poverty. In some countries, that would undo all the gains in poverty reduction they have made during the past decade of growth. Because food markets are in turmoil, civil strife is growing; and because trade and openness itself could be undermined, the food crisis of 2008 may become a challenge to globalisation. 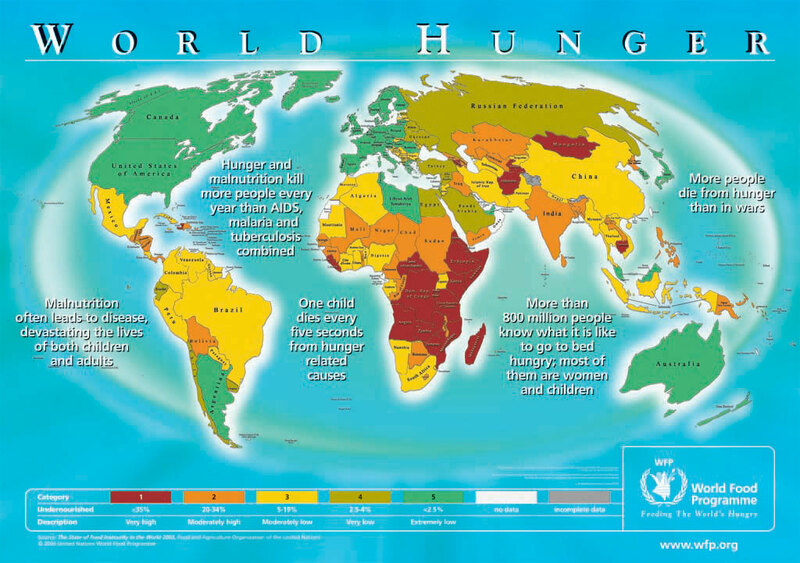 Here is a world hunger map from the UN Food Program. What do you think the various colors represent?